You guys, I’ve got to be honest with you. I’ve had some ups and downs with chicken over the last decade – okay okay okay fine, maybe it’s been mostly downs. But the good news today is that things are finally taking a beautifully crispy turn upwards. Cheers and applause! Maybe I do like chicken after all (read: bacon, white wine, shallots)? This skillet chicken recipe is my new IT recipe — starting with the fact that it’s made entirely in one pan with small bite-sized pieces of salty bacon and sweet caramelized shallots, and ending with the fact that it’s going to have that golden, crispy chicken skin after the chicken is pan-fried a little bit before taking a nice oven-bath in the white wine pan sauce. And will there be warm, crusty bread dipped in the white wine pan sauce in between bites of chicken? Yes. That is all, the end, goodnight. In addition to feeling this chicken recipe AGAIN for dinner tonight, I’m also feeling the lingering mountain energy holding on to me today. AND I LIKE. Bjork and I just returned home late last night from our five day trip to Park City, Utah. Yes that’s right – YOUUUUTAH! We took a baby vacation (er, wait, no. not that kind of baby. I meant like a mini vacation, like a short one, just, like, ugh. Settle down, Mom.) which means we’re visiting Utah for the very first time, and I have to be honest: we’re taking on these mountain ski runs like the haven’t-skiied-in-ten-years skiiers that we are. Which means one green after the other. I have to say, somewhere between my bangs-and-braces days in Ski Club and my current state of doing little to no physical activity involving more than .01 ounces of adrenaline, I must have forgotten that skiing is actually really fun. For a while there (late 90’s? ), I had an identity crisis and I tried to trade in the skiing vibe for the “cool” snowboarder thing. PRAISE AND HALLELUJAH that that phase never went anywhere beyond my wannabe tough 14-year-old self, because now it’s 2015, and skiing is most definitely baaaaaack in the fun, cool person winter sports category where it belongs, and, I mean, just look at me. Snowboarding is not in my blood. Probably the single worst thing for me about taking a trip is the Dreaded Unpacking. We got back at about midnight last night, I took out the essentials, and then planted my full suitcase on the living room floor where it will probably remain until the next time I invite people over to my house in 800 weeks. Even though there might be a suitcase on my living room floor, there will be THIS CHICKEN in my oven tonight and I’m not sad about it. If unpacking is my worst trip thing, then my best trip thing is getting back to cooking my own food in my own kitchen after a week of overdoing it on the overwhelmingly delicious and inspiring restaurant food. I’m going to the grocery store this morning and it feels like Christmas. This chicken, though! It’s company-worthy but it’s easy enough for a weeknight. It’s beautiful and one-pot simple. Have the bread close at hand, pass the salad around, keep the glasses full, and enjoy the yummiest skillet chicken with bacon and white wine sauce. 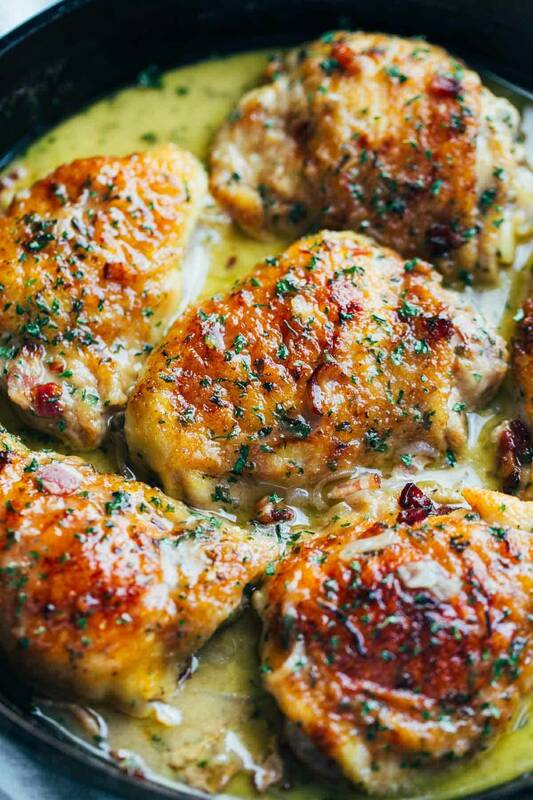 Skillet Chicken with Bacon and White Wine Sauce – this simple crowd-pleasing recipe goes perfectly with warm bread and a green salad! **I preferred the chicken thighs in this recipe because of the crispy skin and the flavor and texture of the meat. Bjork preferred the version I made with boneless, skinless chicken breasts. Either can work! The chicken thighs will render more fat, so if you do us chicken thighs, it’s not a bad idea to skim the oil off the top of the pan sauce after baking. YUM!!! Chicken AND Bacon?!?!? All good. Can’t wait to try this. I love skiing! I’ve skied since I was little and with the lack of snow we’ve had lately I’m totally missing it! This chicken looks fantastic! I make something similar but I’ll definitely be adding bacon to it from now on! Bacon makes everything better. Unpacking is the worst! I put it off for far too long. But this chicken makes it all better for sure. Looks perfect. I’ll definitely need to add to the menu soon! This looks amazing. I have thighs in the freezer. I think I should take those babies out and make this soon. I love mushrooms and so maybe I’ll try adding some with the shallots. Oh, gosh, the mushrooms are an excellent idea. My husband will stand over my shoulder and pick them out of the pan when I cook them in butter and wine. I am definitely making a note of the mushroom thing. This looks so beautiful I might cry. ALL THE AFTERNOON HUNGER PANGS. You gave a 5 star rating? Have you already made this?. It was just posted this morning! I agree. I don’t think you should rate recipes unless you’ve made them. Apologies. I didn’t know that’s how it worked! Amazing! I love anything with shallots or bacon, so both is just more than perfect. I’m a huge fan of thighs (and can’t believe Bjork prefers the boneless skinless)! This is such a perfect and romantic meal for this weekend! Was just saying (aka complaining) to my hubby this weekend how much I miss grilled chicken during the winters… thinking this may hold me over until Spring now! =) YUM!! To me, as long as there is (enough) bacon, everything feels like home. I totally get why you love to make a dish like this yummy chicken recipe, instead of unpacking your bags, because once the delicious smell spreads in the house it feels like you have never left! So I know this is supposed to be about the chicken, but those onions!? WOW. This looks amazing. Those onions…that sauce…. I need this in my life. 5 star review? This was on only posted 1 hour 15 min ago and you’ve already made it?! Why do you care? Maybe she is just excited about the recipe. Whoa Sarah… what is up with the star monitoring? Have you always felt so strongly about the distribution of star giving? I can just envision you in kindergarten stealing those metalic star stickers from your peers in kindergarten. P.S. I have also given five stars but I’m mainly just doing it to give myself a high five for my comment… which I’m pretty sure is also against “the rules”. I think a star rating is for ..”did you like this AFTER y9u cooked it?” It is too confusing if everyone gives a 5 star to a recipe they like to READ…I like to try 5 and 4 star recipes, but not because someone is giving themselves a 5 star…It is about a recipe, not a person, or reading a good recipe. I agree with Barbara. I don’t think Stars should be given based on how a recipe SOUNDS. Now, that being said, this recipe does indeed look like it would be worth 5* after trying it! Can’t wait to make it! Amen sister. These people don’t get it. Recipes are to be rated on taste and preparation not to give yourself a high five for making a comment. Obviously these people are not seasoned cooks. What are you the recipe police? Lighten up! Have you made this? Why rate a recipe you haven’t cooked? Sarah- No need to be rude to others. Why don’t you chill about it. They are hypothetical “stars” on a blog recipe. Maybe she is just as excited to make this recipe as I am! 5 stars for me too! Making it tomorrow night! I am about to make this recipe. It sounds like it will be a good recipe, and I also have the ingredients I need. I am off work and love to cook..it puts me in a good mood.. but “Sarah’s” attitude makes me never want to use her recipes, mainly because I already have a bitter taste in my mouth beforehand. She literally drills these people like a drill sergeant, “barking” at them. You should remain humble..these individuals are intrigued and excited to see this blog. Keyword: blog. Maybe you should design the website to where it says “Rate how this recipe worked for you” -since the main issue is knowing if the person actually tried out the recipe first. …playing devils advocate here. Now, I will go make this recipe and possibly come back and rate it. The IDEA of it would be given a 5 star rating. However, I feel like I would get chastised for that, like a child, so I will refrain. – I dredged chicken in a mixture of egg (1) and a bit of cream I had on hand THEN dredged in the flour mixture. It tends to stick better, brown better, and have thicker crust this way (and it will thicken the sauce a bit too). 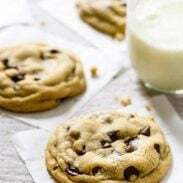 – Added a handful of parmesan cheese to the flour mixture for a bit of “bite”. Result: A very savory sauce and flavor! I liked it! Husband liked it! College-age son – eh – wasn’t his thing, but he didn’t dislike it either. I wouldn’t say this is my most favorite chicken recipe, but I would likely make this again. I was worried that the chicken breasts would dry out since they were pretty big – but they remained moist! Served it with brown & wild rice – which complimented it perfectly. Suggestions: You’re not left with a lot of sauce at the end – I turned down the heat about halfway through noticing the sauce was evaporating quickly. I would add just a bit more wine and chicken stock if you like a lot of sauce. 🙂 For us – it was fine, though. More bacon wouldn’t hurt – 🙂 Maybe another slice or two at most. I would also toss something with a bit of kick into the flour next time – maybe a little more parmesan, and definitely a bit more salt. But you don’t want to drown out the herbs – they made the whole house smell wonderful (comfort food). ***OOPS – also – I did NOT cover the dish at any time (iron skillet). I realize it’s recommended, however, I wanted the chicken to stay crispy. 🙂 Thus – turning down the heat a bit to spare the sauce from evaporating too much. Kim, you didn’t go by the recipe so how can you rate it when you added this and added that. You should do your own blog. Wow, thanks for that detailed review Kim! We appreciate your time and we’re glad you enjoyed it! This looks amazing, Lindsay. I’m not sure what excites me the most—the bacon or wine sauce. The best part is I don’t have to choose. I can have both with this! 🙂 Awesome to hear you visited Utah and were in my neck of the woods. I hope you enjoyed your trip! Long time reader, first time commenter. 🙂 Super novice question here (sorry! ), do you cover the chicken while its baking? Thanks for having a hilarious sense of humor, making amazing food, and being willing to share it with all of us! Your chicken will crisp up better without being covered. The basting that Lindsay advises will help the chicken from drying out (also the higher fat content of the thighs will make for a more tender and juicy chicken). Thanks Jenn! I really appreciate that you explained the answer too. It makes a lot of sense! Thanks Liz! I did not cover it. I have skied twice and it did not end well. I have hung up my skis for good despite my husbands protests. This chicken though would have no protests. Delicious! Shouldn’t you wait until AFTER trying this recipe to rate it? Sarah, well just look at the pictures of this recipe, a good cook can tell it’s going to be five stars (wink, wink). Lindsay, I had the same question, do you cover the chicken in the oven? Nope – didn’t cover the chicken! Sarah – gurl you crayzi as a mug! I luv dis recipe!! YA HURD??? Dang Sarah, why you be such a hater? Don’t you have anything else to do all day long? Why don’t you make it and tell us all how it came out???? Or go bake some cookies or something. Oh my Lord! Bacon and wine is the new….well, bacon and beer! This looks incredible. I totally agree about the dreaded unpacking. My suitcase sits unpacked for days. I usually take the dirties out and live out of the suit case with the clean clothes. Is that crazy? The color on that chicken is to die for! My Grandpa would just squeeze you for the idea of having pan drippings for crusty bread dipping… Might have to make this for him soon! You have GOT to do the 15-minute rule at the end of a vacation! It has saved us countless times. We don’t consider ourselves “home” until we stumble in the door, beeline straight to the kitchen timer and (no matter how exhausted we are), run around like crazy maniacs putting everything away, down to the last toothbrush, and start one load of laundry. Those fifteen minutes are sheer torture, but the bliss that rushes in when the timer dings and we are DONE is just a tiny taste of heaven. Seriously. Also… you sound like Shauna in this post. I mean that in the most compliment-y way! There’s something of her heart in here and I love it. I LOVE the 15-Minute Rule idea! I definitely will put that rule into action the next time I return from a vacation! I also LUUHV the recipe using chicken thighs, bacon and wine, (what’s not to like about that?) and will be trying it this week! Thanks to all! The recipe does look delicious and we do eat a lot of chicken. . . . this is on the roster. That being said I will argue the point that just because a picture of a recipe looks to die for does not necessarily make it delicious. I made a recipe out of Cooking Light that looked and sounded so good — and I spent quite a bit on the ingredients– it was BLAH!!!! No taste nothing. Someone had given it a five star and then another person one . The one star person was right on the mark about the review. I tried to add my one star to agree but funny thing it wouldn’t let me. BUT!! I’m sure Lindsay taste tested her recipe and I trust her to not let us down. Although the stars should be rated after doing to recipe for honesty sake. This is making my mouth water. I want to take a piece of that chicken, nestle it on a bed of steamy rice and then spoon all the amazing sauce on top. And it’s made in one pan. So one pan for the chicken, one pan for the rice, one for a veg and I am good to go! Yum! More than a pinch of yum in this one and I have it pinned!